I haven't done a Currently Loving post for ages so it's about time I shared some of the things I am really enjoying using right now. It does have SPF but it's really low at SPF10 so doesn't cause any major flashback with flash photography. If I am going out in the evening I put this on with a beauty blender in spades for the best version of my own skin. I absolutely love any 'blackened green with a touch of duochrome' eyeshadow. 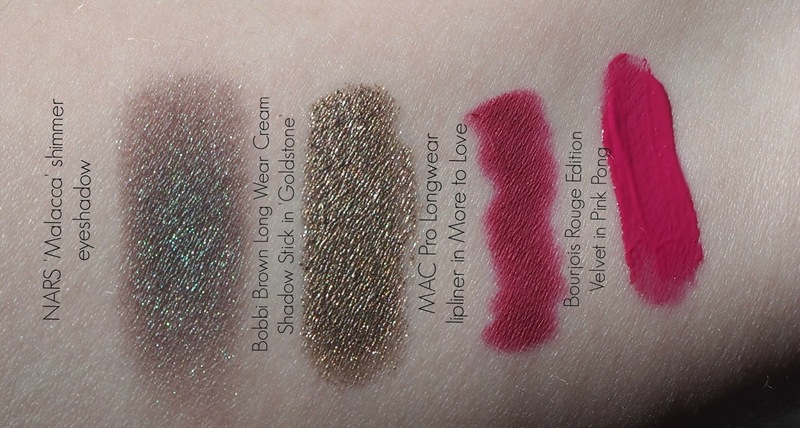 I own MAC Club, NARS Pasiphae and a Kat Von D shadeshifter shadow that now seems to be discontinued-all are very similar but yet unique in their own way. I really like Malacca though, the pigmentation is fantastic. I love the jade green through it and that it isn't too warm or red toned. This is winter in an eyeshadow to me. My love for this product continues! It's such a lovely serum with high quality ingredients that make a huge difference to my skin. What attracted me personally to this serum is that it was exfoliating/resurfacing but it was non-glycolic. Don't get me wrong I still love a bit of Glycolic acid in my routine but I think at the moment my skin responds better to BHA's like Salicylic and Lactic Acid and the main ingredient of this serum is Lactic Acid. This serum is very light and non oily and it sinks into my skin immediately leaving no residue. When I wake up the next day my skin just looks clear and healthy-it really seems to stop any spots in the tracks and I have noticed a marked difference in my old acne red scars-especially on my chin. My pores around the bottom of my nose also look smaller. I get no tingling at all with this product and I do think it is more on the gentle side and even though the recommended use is 2-3 times a week I find myself using it almost every day, My skin is clearer and smoother and I love love it. I wrote a full review of it here. Another eyeshadow I have been surprisingly impressed with is this cream eyeshadow stick from Bobbi Brown. I really struggle to get along with Bobbi Brown products-I have tried a lot but never loved anything-same with Laura Mercier (yeah yeah I know I know #badbeautyblogger). Goldstone is really nice though-it's creamy enough to blend out before it sets but once it does set it's on. It lasts all day on me and has a really nice gold foil opaque finish. It's borderline OTT for daytime but is the perfect lazy girl swipe and go eyeshadow so I am happy to go with 'next level metallic eyelids' all day every day. I recently blogged about my whole MAC lip liner collection and I find myself constantly reaching for More to Love. The Pro Longwear lip liner formula is my absolute favourite-it doesn't drag on the lips, it's creamy but not slippy and they're really long lasting. More to Love is a vivid blue based pink that I have been pairing with every bold pink lip I have been wearing. And I wear pink lipstick 5 days out of 7 usually! Proving my above point about my love for pink lipstick, my final fave is the best drugstore liquid lipstick out there. I recently pulled this out of my stash and was wowed again by the formula. Opaque, even, easy to apply, long lasting, non drying-what more could you want. You can see me wearing it on my profile picture on my blog and a full review here. I also included this in my 3 hot pinks for every budget post.